We recommend checking out our discussion threads on the Barco F50 WUXGA 3D Multimedia Projector R9023188, which address similar problems with connecting and setting up Multimedia Projectors Barco. The user manual for the Barco F50 WUXGA 3D Multimedia Projector R9023188 provides necessary instructions for the proper use of the product A/V Presentation - Projectors - Multimedia Projectors. 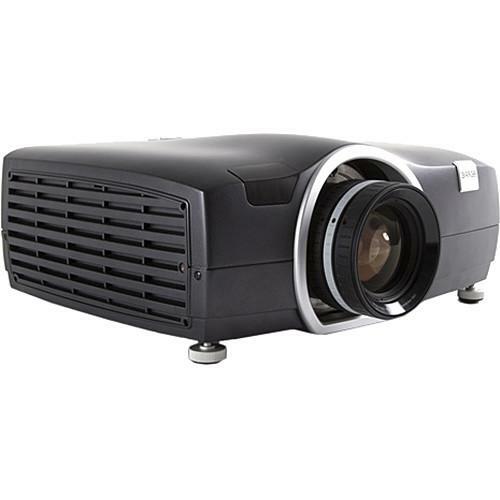 The black metallic F50 WUXGA 3D Multimedia Projector with lens available separately from Barco is a professional 3D projector adaptable to a range of applications requiring 24/7 operation. Suitable fields include virtual reality, simulation and training, visitor attractions, collaboration suites and scientific visualization. The projector features a brightness of up to 2700 lumens (depending on settings), and has a native resolution of WUXGA. This is a 16:9 format. In addition to its native aspect ratio and resolution, through internal scaling the F50 can accommodate a wide range of formats, from 480p SD all the way up to 2560 x 1600. The F50 features connectivity to accommodate a variety of sources. There are two DisplayPort 1.2 inputs, plus one DVI-DL and one HDMI input. For analog computer graphics or integration with existing A/V systems, there is a VGA port. For professional digital video sources, there are two 3G-SDI ports. Finally, for long-run HDTV signals there is one HDBaseT Ethernet port. For remote operation, there is an Ethernet port that enables control across a local network, and there is an RS-232 port for integration with automation systems such as Crestron. A USB port enables direct operation from a computer. If you own a Barco multimedia projectors and have a user manual in electronic form, you can upload it to this website using the link on the right side of the screen. The user manual for the Barco F50 WUXGA 3D Multimedia Projector R9023188 can be downloaded in .pdf format if it did not come with your new multimedia projectors, although the seller is required to supply one. It is also quite common that customers throw out the user manual with the box, or put the CD away somewhere and then can’t find it. That’s why we and other Barco users keep a unique electronic library for Barco multimedia projectorss, where you can use our link to download the user manual for the Barco F50 WUXGA 3D Multimedia Projector R9023188. The user manual lists all of the functions of the Barco F50 WUXGA 3D Multimedia Projector R9023188, all the basic and advanced features and tells you how to use the multimedia projectors. The manual also provides troubleshooting for common problems. Even greater detail is provided by the service manual, which is not typically shipped with the product, but which can often be downloaded from Barco service. If you want to help expand our database, you can upload a link to this website to download a user manual or service manual, ideally in .pdf format. These pages are created by you – users of the Barco F50 WUXGA 3D Multimedia Projector R9023188. User manuals are also available on the Barco website under A/V Presentation - Projectors - Multimedia Projectors.